The International Association of Machinists and Aerospace Workers (IAM) today submitted comments regarding the DOT’s Notice of Proposed Rulemaking (NPRM) concerning the “protection of passengers from being unwillingly exposed to inflight voice calls.” The DOT seeks comment on whether to prohibit airlines from allowing passengers to make voice calls from wireless mobile devices on domestic and/or international flights and its proposal to require the sellers of air transportation to provide adequate advance notice to passengers if the carrier operating the flight allows voice calls on wireless mobile devices. The IAM asked the DOT to consider the stress and distractions flight attendants would undoubtedly encounter by permitting inflight voice calls. It’s inevitable that flight attendants will have to neutralize cabin situations caused by hostility between passengers stemming from inflight voice calls. 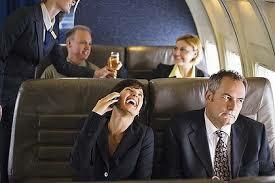 The use of inflight cell phones may also pose additional security risks. Potentially, terrorists aboard a single or multiple aircrafts could use this new capability to communicate with each other about the movement and vulnerability of crew members or to even initiate a coordinated attack.